Consistently ranked among the country’s best places to live, Asheville is one of the rare cities that live up to hype. Crunchy? Come for the vibrant music scene and vegetarian dining. Artistic? Soak in the galleries and art deco architecture. Adventurous? Biking trails and whitewater rapids await you. Best of all, you can get there and back on a single tank of gas. Asheville owes much of its architectural singularity to the captains of industry who popularized the place in the Gilded Age. E.W. Grove, a St. Louis man who made a fortune selling “Tasteless Chill Tonic” to malaria sufferers, built Asheville’s most remarkable hotel, the Grove Park Inn (800-438-5800, groveparkinn.com), with granite cut from Sunset Mountain. With its enormous lobby, elevators tucked into stone chimneys, and breathtaking views, the Grove is worth a stop for at least a drink. For those on a more modest budget, drive to Biltmore Village, less than two miles from the city center. There, just outside the gates of Biltmore Estate, is the Grand Bohemian Hotel Asheville, the newest addition to the Kessler chain (877-274-1242, bohemianhotelasheville.com). The European hunting lodge theme boasts dorky touches such as chandeliers made from deer antlers and a stuffed boar wearing a Tyrolean hat. 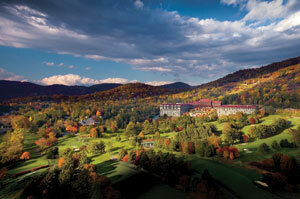 You can’t go to Asheville without dropping by Biltmore Estate (800-411-3812, biltmore.com). Built by George Vanderbilt in the late nineteenth century, the château contains 250 rooms, an indoor pool, and a dining room straight out of Citizen Kane, bringing new meaning to the word “overcompensating.” Biltmore is still owned and operated by Vanderbilt’s descendants, who charge a whopping $55 to get onto the grounds. (It’s cheaper if you reserve online.) Be sure to stroll around the gardens, designed by Frederick Law Olmsted, and check out the winery. Before heading back downtown, drop by the New Morning Gallery (828-274-2831, newmorninggallerync.com) for a spread of handmade furniture, ceramics, and tasteful tchotchkes. Downtown Asheville is small enough to walk, but step aboard the historic trolley for a ninety-minute narrated tour (888-667-3600, ashevilletrolleytours.com). For a city of its size (barely 70,000), Asheville boasts an inordinate number of awesome restaurants. If, for example, you haven’t had the sweet potato pancake at Tupelo Honey Cafe (828-255-4863), your time on Earth remains squandered. Executive chef Brian Sonoskus even has a twelve-acre farm that provides organic food to his kitchen. Carnivores will not miss meat at Laughing Seed Cafe (828-252-3445), where the cooks do amazing stuff with tofu and tempeh and fresh vegetables. At night, check out the intimate Table (828-254-8980), where the food is prepared right near the front door and the seafood choices are exquisite. On the way back to the hotel, drop by Jack of the Wood (828-252-5445, downstairs from the Laughing Seed) for some house-brewed Green Man ales. And for late-night music, check out the legendary Orange Peel (828-225-5851), one of the best small venues in the nation.